Margaret Taylor grew up on a farm in the rural English countryside and has been painting livestock portraits for 20 years. Enamored owners can buy an expressionistic oil painting, a hyper realistic pencil drawing, or have their cat transformed into a medieval knight. But leave suburbia and the landscape and paintings change. Farmers and ranchers can be just as bonkers about their animals, and in rural communities there are portraits of cows and horses over the couch. Livestock artists have carved out a niche catering to folks who don’t just own animals — they make their living through them. Margaret Taylor grew up on a farm in the rural English countryside, where she sang to her sister’s Lincoln Red cow. 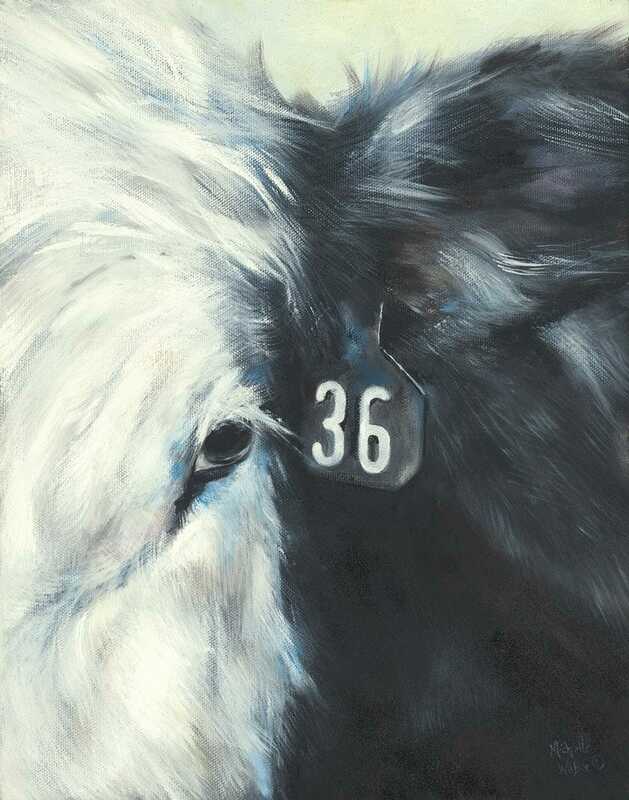 She has been painting livestock portraits for 20 years and completed hundreds. She is particularly sought after for her work in ceramics, such as tiles and tableware. 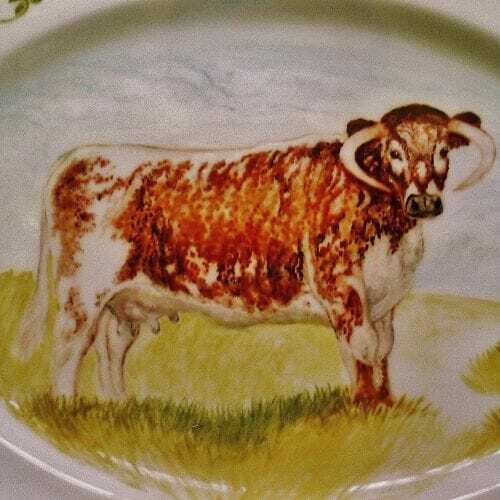 A “real gentleman of a farmer”, who named all his cattle after an herb, shrub, or flower, requested that Taylor paint his cow, Elder (for Elderberry), on a meat plate ringed in roses. Presumably, the surface could also be covered in other cows later, although in not quite the same form. 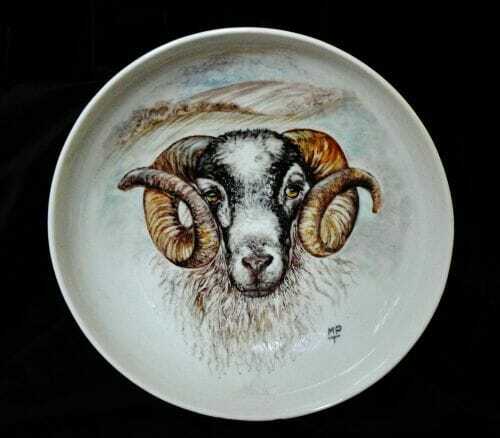 Taylor has carved out a niche for herself painting rare, heritage breeds and speaks of her subjects in glowing terms. A breed of cattle called the White Park is “superb,” English Longhorn cattle are “very attractive” and “ever so pretty.” Cattle are a frequent request, although she has also painted pigs, chickens and other beloved barnyard members. She was once commissioned to paint a supposedly haunted Victorian building, and said she couldn’t resist adding a few Belted Galloway cows to the landscape. But she continued to make art as a hobby, and one day posted a photo of a cattle painting to Facebook. The picture didn’t just collect “likes,” it generated interest among her friends in purchasing their very own painting. She began producing portraits on the side of her graphic design job, and eventually quit her day job altogether. Now she paints fulltime, in addition to working the ranch with her husband. 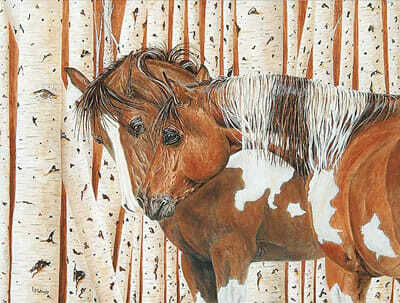 She has illustrated a children’s book and participated in livestock painting competitions and gallery shows. “I never know what’s going to be in my inbox,” says Weber, who recently received a commission from Australia, and has painted sheep and horses, although cattle are her specialty. As a rancher, Weber has a special understanding of why an owner would want a portrait of their animal. “Their livestock are their livelihood, they spend so much time with their livestock – 24/7, seven days a week, 365 days a year – that these cattle have earned a place on their ranch, in their memory,” she says. Livestock owners can be every bit as a finicky as a pet owner, as Weber knows. She works from photographs, and advises clients to send her their favorite image, so that the painting will mirror the owner’s most cherished vision of their animal. Taylor also works from photographs, and if possible, will visit the animals on site. She then conducts an interview with the owner to learn more about the animal. “Personality is a big thing, because if they say ‘She’s a feisty, high-strung cow,’ I can get an idea of the nature of the cow,” she says. For those who want to immortalize their cow, horse or hog, the costs are not insignificant. Taylor says a work of “modest size” will run a client around $600, with the price climbing as the size and scope of the work increases. Weber charges a deposit and an hourly rate, with pieces selling in the $600 to $900 range, and Matsuda’s work starts at $350. 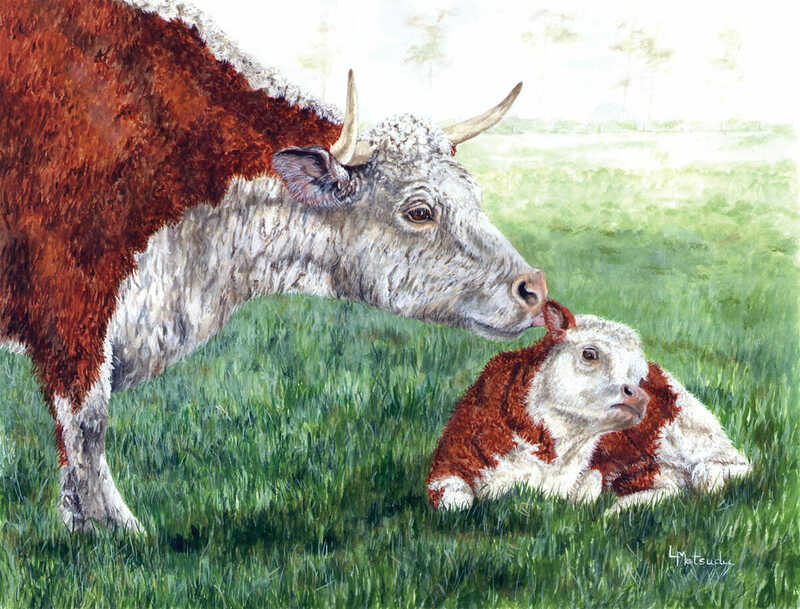 But for those willing to invest in a piece of livestock art, the work they commission is likely to be as unique as their animals.